We’ve all been through the struggle of trying to manage and organize the wardrobe. Whether you’re a fashion enthusiast or just a regular shopper, you’re bound to reach a point where closet space will start to become a rare commodity, and you’ll be struggling for the smallest bit of free space. A bigger problem is when you choose to cram everything together which will result in a wrinkled mess of clothes. You should always avoid such solutions as they are just a temporary and often ineffective fix. This is why you need to kit your closets with the proper storage solutions so you can optimize the space it offers and use it to its fullest potential. With that said, there are many things you can get, and each storage solution is aimed towards something specific, which allows you to save on space and also stay as organized and tidy as possible. While the majority of closets already come with a rod on which you can put cloth hangers for coats and jackets. However, in most cases, that isn’t enough, and you’ll eventually need to invest in more closet storage to accommodate the never-ending stream of new clothes. You can increase your closet storage in many ways. Just as we mentioned earlier, each type of storage serves a purpose. For instance, hanging storage can be useful for storing coats, jackets, and similar clothing, while vertical organizers can be used to more effectively store shoes and such. There are also more specialized and advanced storage options such as vacuum bags and standing shelving. In the end, it will come down to what you need. You can do an extra bit of research to help you figure out the best storage solution. Hangers are convenient for keeping your clothes nice and tidy. However, the standard hanging storage that your closet offers might not be enough for the long run as you’ll keep getting more and more clothes. This is where you’re better off investing in extra storage in the way of hangers. These will allow you to instantly get the clothes you want without having to sift through your whole collection. There are numerous forms of hanging storage solutions, such as multi-storage hangers, storage bags, scarf storage, and shoe cubbies to mention a few. There is also over the door storage which offers new storage opportunity. You can use that new space to store a variety of things such as cleaning supplies, brooms, mops, or even jewelry. Shelves and organizers are a common storage solution. You’ll find that they are rather versatile and can be used in almost every room in the house. In this case, they are used primarily for storing sheets. There are numerous different shapes and sizes of shelf organizers that are all used to store different things. They are very good at minimizing clutter while keeping things organized and tidy at the same time. 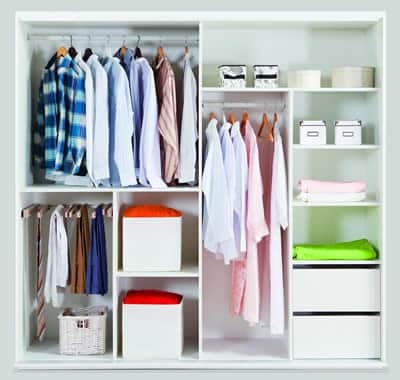 Investing in extra shelving for your closet will always pay off, be it for the kitchen, bathroom, bedroom, or any other room in the house, shelf organizers will help you keep everything organized and will help you get rid of clutter. Whenever a new season comes, you are eventually going to switch clothes. The thing is, you’ll still need a place to put the other clothes in so you can use them for next year. Knowing that, it’s wise to invest in bulk storage. It can help you keep your closet all tidy and clean all throughout the year. There numerous ways you can invest in bulk storage, the best way is to get vacuum bags which will help you save up on space. Most vacuum bags compress clothes and keep them isolated, so they don’t gather dust. Evidently, most of these bags are also grime and waterproof, so they do a fantastic job at preserving whatever you put in them. You can also use them with vacuum cleaners. With that said, if vacuum bags are not your cup of tea, then you can always go with a trusty storage bin. They’re pretty much like cardboard boxes but more convenient as you can use them to store pretty much anything you might need. They are mostly used for long-term storage. Check out the video below for some great and simple ways to organize a small closet and really get the most out of the space. All in all, regardless of whether you are a big fashion enthuistast or just a regular guy or gal trying to get buy, closet storage is something everyone should invest into. Not only can takeing your time to find the best solution for your needs save you a lot of time and frustration, but it can also minimize the clutter inside your home.